Little wooden house in private garden. Unique couples retreat, a luxury self catering property. The Garden Shed is set in the grounds of the Old Forge, Sand Hutton, York. The property is set in a peaceful location, surrounded by stunning gardens. Only 20 minutes from the tourist attractions of York, yet within easy reach of cycling trails, the Yorkshire Wolds, North York Moors, and many other fantastic Yorkshire attractions, The Old Forge is perfectly placed to be the base for your getaway. The property is fully equipped with everything you need, including a kitchen with oven, dishwasher and fridge freezer. There is also a real log burner to keep you toasty, and the cosy bedroom has an ensuite shower room and a TV / DVD player. If you are a cyclist, we can provide secure storage for your bike, and welcome well behaved dogs. Guests receive a welcome hamper on arrival, and our resident hens will be happy to provide you with tasty eggs for your breakfast. 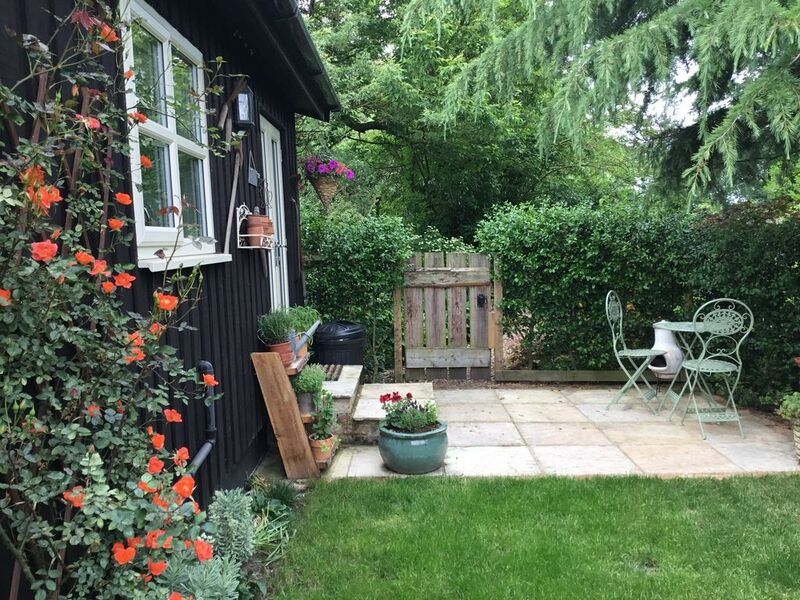 We love living here, and are confident that you will love spending time in The Garden Shed. My husband Adam and I bought The Old Forge (and The Garden Shed) in August 2013 in a poor state, and since then have worked hard to restore both the property and the gardens. We love the results and are sure you will do too. We love the space it gives us for our animals, and currently have two guinea pigs, three rabbits, eight chickens (although that number changes regularly!) and a small dog called Bob. It's a stunning property, with the most exceptional gardens, in a brilliant location! It has all the benefits of living in a city but with countryside all around. Secluded, unique little house set in private gardens. Ideal for couples who want to escape from it all and spend time together. Ensuite shower room to bedroom. Cosy open plan living / kitchen diner, with sofa, TV / DVD, log burner, dining table. Electric cooker, four electric hobs with extractor fan, fridge/freezer, microwave, dishwasher. Nearest golf course is three miles away. Lots of others within easy reach. Outside: As well as being set in beautiful gardens, The Garden Shed has it's own private garden and patio area set up for alfresco dining. Towels and linen provided. Had a fantastic relaxing weekend in 'the garden shed ' could not want for a more accommodating host Karen. There's nothing negative to say at all! Nothing was to much trouble, the place was nothing short of amazing can't wait to return. Thank you Mark for this review! Really looking forward to seeing you and Olivia again. Big changes in the garden in the next two months and the woodland fire pit will be ready for this summer. Hurray!! Had two lovely nights stay in the garden shead. Lots of personal touchers make it special. Such peaceful surroundings. Would love to return one day. Never met Karen but Adam was very welcomming. Thank you so much! My husband Adam will really appreciate your kind words and be very proud he did such a great job for me ! The garden shed was the perfect peaceful getaway , so peaceful and tranquil and surrounded by nature, some lovely restaurants near by , and York and all it has to offer close by too, we also enjoyed the lovely log fire so warm and cosy. Karen our host was so lovely and friendly, we wanted for nothing. Excellent we will look forward to our next visit . We have stayed at the Garden Shed on a number of occasions and have had a wonderful, relaxing holiday everytime. The Garden Shed is wonderful and fitted out with everything you would need and to an excellent standard. Karen and Adam are wonderful hosts and are there should you need them but at the same time quietly in the background should you not. We are looking forward to our next stay, as is our Shih Tzu Benni. Thank you again Karen and Adam for our wonderful stay. So lovely to see you all again. I have added a standing lamp in the corner by the door and it has made so much difference. Thank you for this suggestion. Wishing you a very a Happy Christmas and 2019. This was a lovely place to stay for a weekend get away, and the limited signal added to the experience. It’s very close to park and rides to get into York which were very easy to use and I would recommend doing. When we have another trip to York we would defiantly look to book at the garden shead again. For the price there is a lot of value and personality, and the hospitality was 5*. The North Yorkshire Coast is approximately 40 minutes away by car. York is just two hours on the train from London and Sand Hutton is just 20 minute taxi ride from the station. Use of a car is recommended, but there are several car hire locations in York itself. Leeds Bradford Airport is about an hour away. York is 8 miles away. North Yorkshire coast is 40 minutes away. The village of Stamford Bridge, with a small selection of shops, cafés, restaurants and takeaways is only 7 minutes away.